And much of it is powered by the obsession with one game: "Fortnite." During the last month, people have spent more than 128 million hours on Twitch just watching other people play "Fortnite," the game that took all the best elements of building, shooting and survival games and merged them into one. How obsessed are people? After each of their wins this season, the Houston Astros — among many other sports teams — are doing a very specific dance, their arms in the air, fingers spread, their legs bent, toes tapping rapidly. It's a "Fortnite" dance. "Fortnite" content received 2.4 billion views on YouTube in February alone, according to Tubular Insights. So yes, people love playing video games — but people also love to watch others compete at them. For gaming, this is a moment of convergence of trends. Professional esports leagues around games like "League of Legends" are growing more popular and more serious; huge numbers of people are tuning into livestreams to watch gamers play ("Fortnite" broke the record), and going to YouTube to get fun game-centric content from game celebrities. At the same time, physical spaces around the country are being renovated into gamer bars. Those 150 million gamers in America want to gather. They want to sit next to one another, elbow to elbow, controller to controller. They want the lighting to be cool, the snacks to be Hot Pockets, and they want a full bar because they are not teenagers anymore. It was inevitable. Movie theater attendance hit a 25-year low in 2017, while 638,000 tuned in to watch Drake play "Fortnite" recently. The Paris Olympics in 2024 are now in talks to include gaming as a demonstration sport. 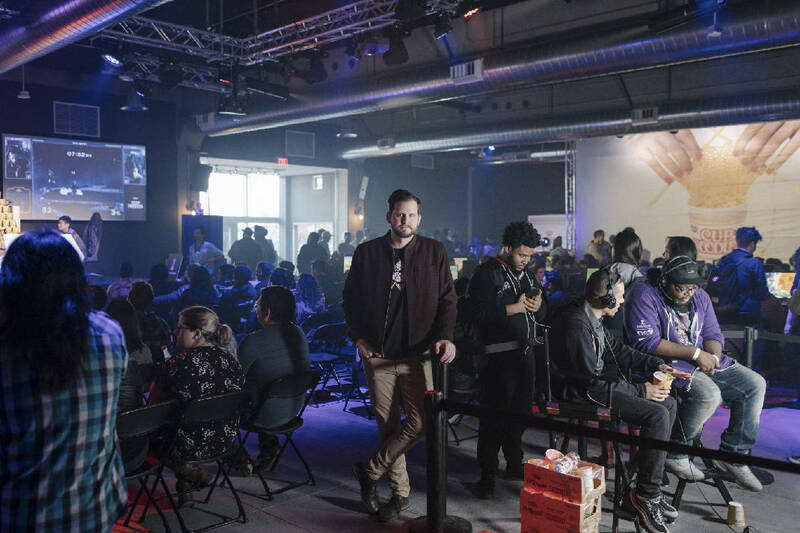 Oakland's new esports arena gave a pre-opening party recently. A line stretched down the block. Nearly 4,000 people jammed into the former parking structure and onto the street around it, right in the touristy heart of Jack London Square. The sponsor was Cup of Noodles. Inside it was cacophony. Landon Trybuch, a 24-year-old from Vancouver, British Columbia, said that it was nice to be out from the sweaty backrooms of video stores where he used to play. "It's amazing," he said, holding his own controller. Its cord had been covered in yarn by his girlfriend. "There's so much room." One recent afternoon in the Hollywood Hills, the guys were tired, but the creative director needed more "Fortnite" content, and so the break-dancers kept going. The guys were FaZe Clan, an esports organization. Their job is to be cool gamers. They stream game play, and they make highly shareable videos about video games. This workday goal is to leave with three to four pieces of viral-ready content. So they would keep filming "guess this dance move" videos. "The Make-A-Wish kids came over a couple weeks ago, and all they wanted to do was play 'Fortnite,'" said Salamone, who used to be on Kid Rock's management team and wears a diamond on one of her teeth. She worries about what happens to the boys — the talent in the clan are all boys — as they grow up. "They all have distinct personalities," Salamone said of the FaZe gamers. "Jev screams all the time." Salamone took me to the corporate office, a WeWork at Hollywood and Vine, where that new gamer management company is taking shape. "The industry is asleep at the switch," he said. "For people my age and older who control a lot of the zeitgeist, the vibe is still 'gamers must be nerds in their parents' basement.'" "The experience of games is so rich, so deep, they deliver on the promise, whereas films have increasingly not delivered on the promise," Trink said. "We're creating a business that's filling a void people don't even know is a void yet." He sees streaming gamers as a fully new genre of mainstream entertainment. And like every generation of entertainment before, they will need their own palaces. Gamers are coming together for practical reasons as well as social ones. Games are so sophisticated that they can overload home connections. And cryptocurrency miners have driven the price of crucial gear — like the graphics card gamers use to amp up their computers' processing speeds. "We're seeing the rebirth of social gaming," Luigino Gigante, 27, who opened a gaming center called Waypoint Cafe on the Lower East Side of New York late last year. "It's bringing back the community aspect of gaming again. It's like, 'OK, we're still playing separately, but we're together.'" And there is an underused asset already at hand. "The movie theater!" said Ann Hand, the chief executive of Super League Gaming, which converts movie theaters into esports arenas and has raised $34 million from investors. "It has that thunderous sound, and it's empty a lot of the time." Two days a week, Hand and her crews convert about 50 movie auditoriums into esports arenas, where kids, mostly younger, compete and watch the winners onstage, projected onto the big screen. For the Super League Gamers, the events can accompany or replace traditional sports. It is a new Little League and Minor League for today's athletes. Each city plays together as a branded team — there's the Chicago Force, the New York Fury, the San Francisco Iconics. So far, there are 50,000 players. Parents accompany younger players, and the real-life experience opens their eyes. "The most common piece of feedback was that they knew their son or daughter loved this game, but they had no way to understand the game or know if they were any good at it," Hand said. "Like, 'I didn't know my son or daughter was that competitive.'"